We were told the city of Coimbra was built on steep hills. I thought, surely they could not be steeper than the hills of Porto, right? Wrong. 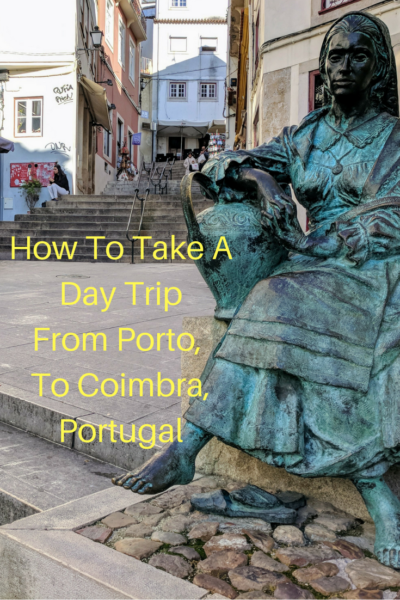 The historic City of Coimbra (pronounced co-eem-bra) is all about the hills and they are definitely steeper than those of Porto, and the cobblestone streets are brutal. By the time we boarded our return train my feet were screaming. But, would I do it all again? Absolutely. Note the pigeon to the left of the C, welcoming us to her city. The narrow streets in Coimbra’s historic center are made of cobblestones – what I call river rock – and packed dirt. Just like in Porto, some of the streets are barely a single lane wide and most often they lead in/out of a small neighborhood square or they just dead end in to a wall. And, like so many places in Porto, in Coimbra there are stairs and more stairs, all very steep. We came upon one set of about 60 stairs that I refused to take on, so we kept walking up and switchbacked to avoid those stairs. But, all of it only serves to add to the charm of Coimbra. If stairs are not in your repertoire, never fear. The city has small electric buses that buzz around the city streets with the utmost ease. And, of course taxis are available. Even the local maiden had to sit and rest. See the cobblestone at her feet? So why visit Coimbra? 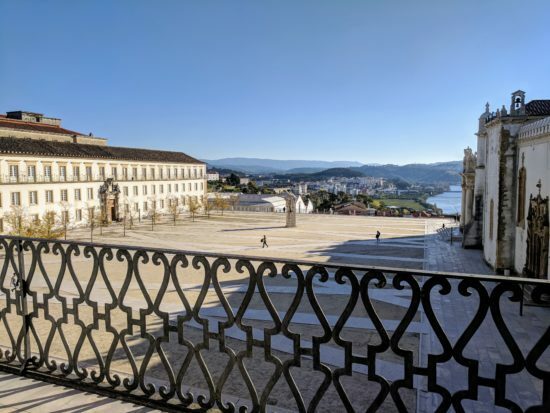 Aside from the hilly historic core of the city lined with shops and cafes, the oldest university in Portugal – Universidade de Coimbra – sits high atop… yes, you guessed it, a hill. The panoramic views of the city and the Modego River are well-worth the upward trek. A UNESCO World Heritage Site, the university was originally founded in 1290 by King Dinis in Lisbon but was eventually settled permanently in Coimbra in 1537. The view from the palace balcony, overlooking the square and the Mondego River. Sometimes it definitely pays to travel in off-season, no crowds to contend with. What really caught our attention though, and the primary reason we made the trip, was the Baroque Library on the campus of the university. Because really, when I read about a library that was built between 1717 – 1728 and houses something along the lines of 40,000 books which are – in part – protected by bats (bats eat moths) it’s just something I’ve got to see, sans the bats of course. It was another one of those jaw-dropping awe-inspiring moments as we stepped into the Nobel Floor room of the library. Not surprisingly photos were not allowed but sometimes that’s actually a good thing because it forces us to be in the moment without having to worry about getting that perfect shot. And, really, how do you get the perfect shot of 40,000 books, centuries old woodwork and gold? It’s a lot to capture. The Nobel Floor is divided in to three rooms and if I remember correctly the rooms house books for Civil Law, Religious Law and Medicine. The books on the shelves are wonderful and can still be checked out. But, alas, not by the average citizen. 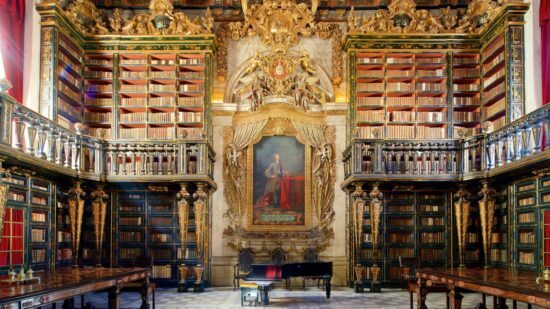 Persons who are allowed to view the books must submit a request and the book will be taken from the Baroque Library to the General Library where it can be viewed. I’m guessing you’ve got to be somebody who plays in the big leagues to get your hands on one of the books. Imagine how fragile each centuries old page must be. As part of our package tour, we also visited the chapel, a few rooms of the palace and we took an interesting – albeit somewhat creepy – tour of the university’s science museum which housed hundreds of species of preserved animals and assorted creatures that go bump in the night. The historic scientific instruments were actually quite interesting to see though. Interestingly, there is apparently a contingency of students – or perhaps they are disgruntled locals – who are not altogether pleased with tourists who visit the university, and/or stay in Coimbra. We came across more than one sign of discontent as we wandered the narrow streets that weave through the campus, which by the way is huge. This message refers to Airbnb stays. We came across another painted message that read, “Tourists, you and the cloaked deserve each other.” The term cloaked refers to the Hogwarts(esque) black cloaks university students wear. 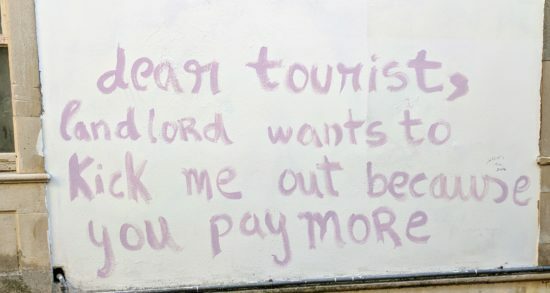 So, it would seem there are those in Coimbra who are not at all happy with the upsurge of Airbnb rentals, as well as the impact of tourism. Although, there is definitely more than one perspective when it comes to tourism. 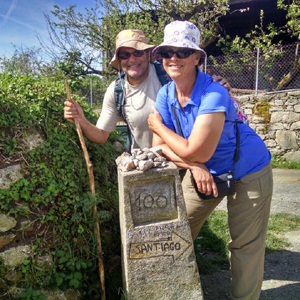 If you’ve never booked an Airbnb stay, I encourage you to read the post of our friends Amy and Andrew from Our Big Fat Travel Adventure who came across a similar sign while visiting Coimbra. They took the message a step further and wrote an informative post about the pros and cons of Airbnb. Winding our way down the narrow streets we found the pedestrian friendly promenade of boutique shops and cafes in the historic center of the city. Planting ourselves at an outdoor cafe we each ordered a panini sandwich – locally known as toast – and while we ate we soaked up the rays of sun and gave our feet a chance to rest. With maybe 45 minutes to spare before having to board our return train we opted to walk to the train station along a different street. We came across the Igreja e Mosteiro da Santa Cruz and as luck would have it, the organist was rehearsing. Each and every time we enter a cathedral or church or … it is my deepest desire that the organist will be rehearsing. It doesn’t happen very often, but when it does it’s really quite special. We recorded this quick video for your listening pleasure, and near the end you’ll see the wonderful blue tile work on the walls of the monastery. 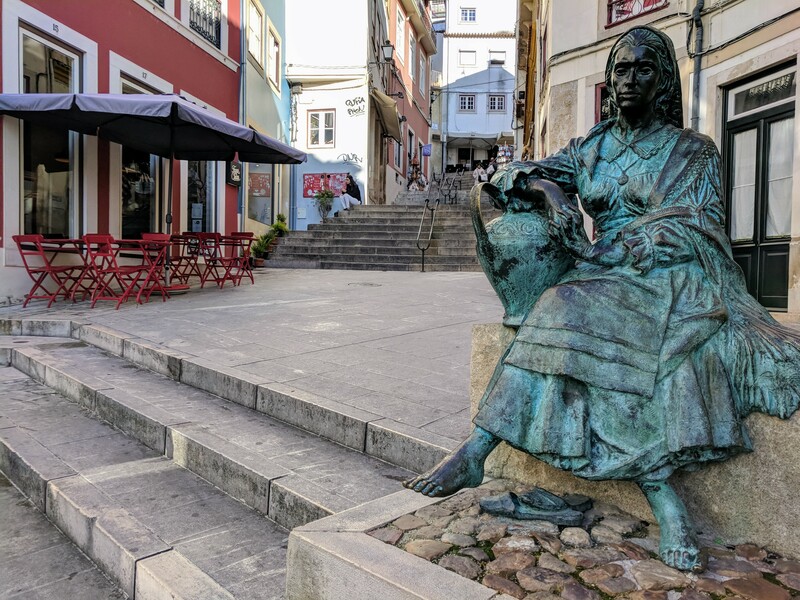 Whether it’s a day trip or an overnight stay, a visit to Coimbra is a step back in time to a Portugal of another era where the university was – and still is – the center of life. 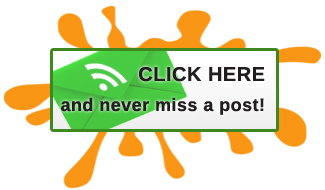 Train from Porto to Coimbra – 27€ regular ticket, 15,50€ for senior. Approximately one hour ride. Program 1 includes the Baroque Library, The Chapel, The Palace and the Science Museum. 12€ adult ticket, 9€ senior ticket. Tickets for university tours can be purchased on campus at the General Library. Entrance to the Baroque Library is strictly timed. Each group spends 20 minutes. No photos allowed. The new cathedral on campus asks for a 1€ per person donation, self-guided. Cafe Montanha is a nice spot for a quick and yummy lunch. Order a meringue puff for dessert! And we thought the streets in Toledo Spain were steep! But I must say it did give us a free and natural workout. It was definitely interesting to see a bunch of elderly women who obviously do that walk up all those hills every day, just float by us, seemingly effortlessly. That’s exactly what we said, Peta, as we watched the elderly women and men just casually climb the hills without missing a step or a breath. But I suppose it comes from a lifetime of practice! That’s pretty much what Abi and I said, Anita, to the culprit leaving the messages around Coimbra. It’s the tourism that’s funding the the economy. It’s a conundrum. I’m with you, Patti: just when you think you’ve seen enough cathedrals, here comes another one. And you have to see it too because they’re all just so magnificent. I know, right?! And each one has a little something different to make it stand out from the others, so of course we have to see it! Thanks, Patti. I will send this on to Elizabeth. She will be in Portugal this spring. It sounds so lovely. Coimbra, Braga, Porto, they’re all special. I know she’ll love Portugal. Beautiful town. We saw the same with Airbnb in Lisbon – every 2nd apartment seemed to be an Airbnb. Up to cities to legislate that. But can imagine what it’s like being a poor university student and having to compete with tourist prices. Anita said it – we ave the same issue here on Croatian coast where people would rather rent out a few months on Airbnb (leaving the apartment empty the rest of the year) then rent it out on a year long lease. Airbnb is definitely causing a stir in the world of accommodations. 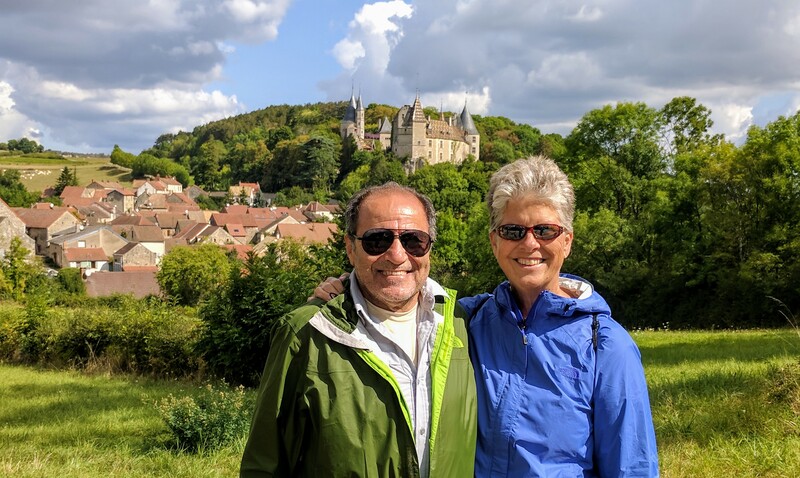 In 2011 – 2013 when we owned our B&B in southern Oregon, the Airbnb buzz was just kicking in to gear and as owners of a B&B, we could see the writing on the wall of what was to come and how it would potentially impact our business. Wow, that library is awesome! But what a special treat to hear the organ. Bummer that tourism is making life tough for locals. Thanks for sharing Patti, the Airbnb issue does plague me still and I’m going to try and avoid the site more next year. Glad you made it to Coimbra though, it’s a beautiful place, I wish we’d had more time there.